One of the fascinating displays at National Trust property, Smallhythe Place in Kent, once the country retreat of actress, Ellen Terry. I recently spent a fascinating day at National Trust Property, Smallhythe Place near Tenterden, Kent, participating in a Costume Day. Smallhythe Place was the country retreat of actress, Ellen Terry, who lived from 1847-1928. Ellen was one of the first modern stars of the British stage, frequently acting alongside Henry Irving in a stage career which spanned sixty-four years. The day began with a talk on Edward Godwin, who had a huge influence on Ellen, and whom she described as ‘the only man she ever loved’. Godwin was an architect, designer and writer and through his association with Terry became interested in all aspects of theatre and designed many costumes for her. Smallhythe Place houses one of the largest selections of 19th Century theatrical costume. One of the most interesting aspects of the day for me was how much work and care goes into ensuring that the costumes are preserved. We received a very interesting hands-on demonstration which taught us how to fold and wrap vintage textiles, making and utilising acid-free tissue paper pads and rolls to support the garments and eliminate sharp creases. There was also an interesting talk on pest control – oh the horrors which those pesky critters can wreak! 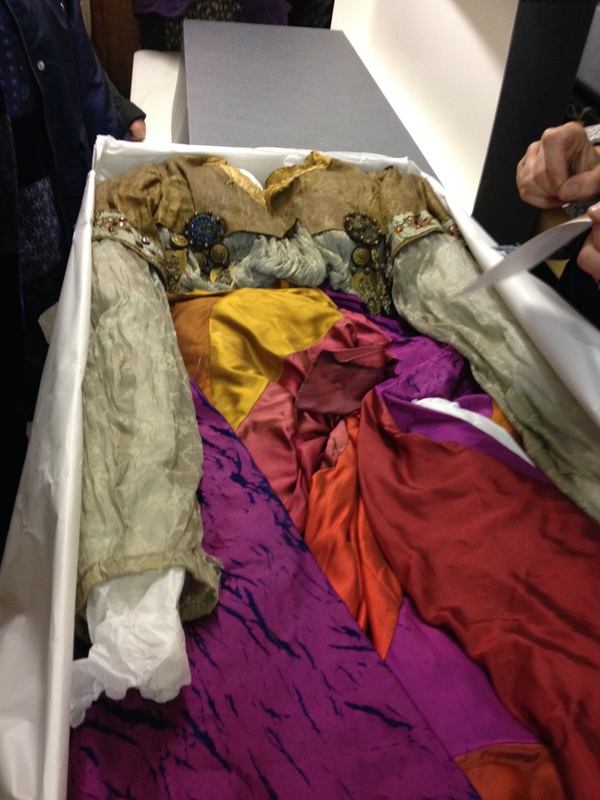 Ellen Terry’s costume from Shakespeare’s Cymbeline. We were given the opportunity to go behind the scenes and visit the costume store – heaven!! 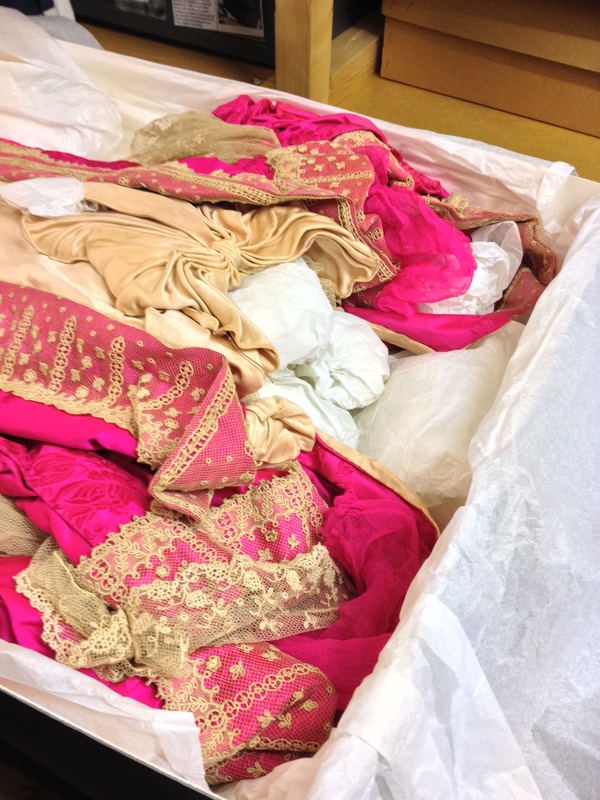 The dresses were stored flat in long, conservation boxes and were well wrapped in tissue, and the room was kept at a certain temperature at all times. We were able to observe a number of garments closely, including costumes from Shakespeare’s ‘Cymbeline’ and Ibsen’s ‘The Vikings’. It was incredible how much detail was put into each costume – there were fine decorative techniques which would have been impossible for an audience to observe once the costumes were being worn on stage. There was also a fabulously well-preserved dress by Worth, which had been made for the actress Lillie Langtry. Ellen Terry’s costume from Ibsen’s The Vikings. Lillie Langtry’s stunning dress from Worth. After lunch, Veronica Isaac, Assistant Curator at the V&A, gave a lecture entitled ‘Highlights from the Wardrobe of ‘The Painter’s Actress’. This was a fascinating insight into the very colourful life of Ellen Terry. She was the daughter of travelling actors and had a very unconventional upbringing, beginning her stage career at nine years old when she played Mamilius in Shakespeare’s A Winter’s Tale. When she was sixteen, Ellen married the artist GF Watts, who was forty years her senior. The marriage broke down within the first year, and Ellen eloped with Edward Godwin, with whom she had two children. Watts refused to divorce Ellen and, as a result of the elopement she was estranged from her family. Godwin left Ellen after seven years following financial difficulties. Ellen and Edward were both part of the aesthetic movement which celebrated beauty and art over more practical considerations. In terms of fashion the aesthetes rebelled against corsets and restrictive clothing, wearing looser garments which harked back to the fashions of the Regency period. 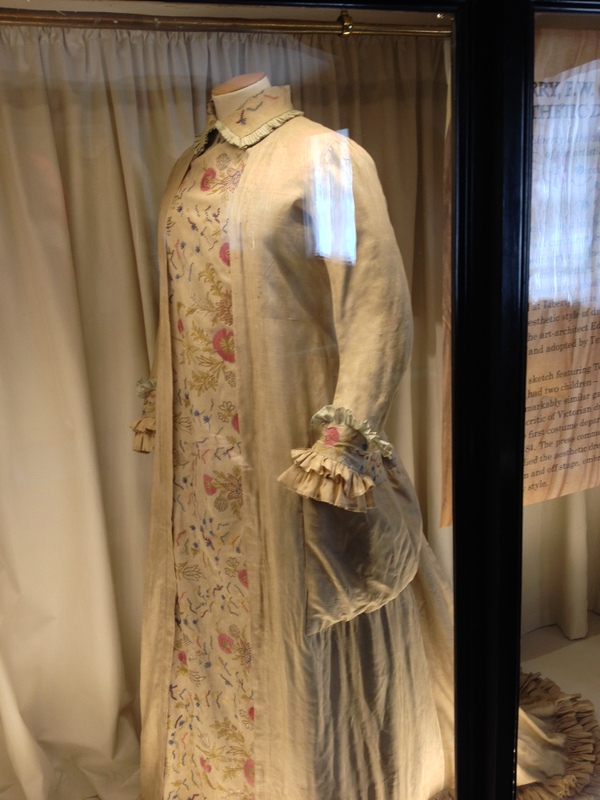 This is Ellen Terry’s Liberty Dress, which is made from silk and wool and features hand-embroidered tambour work in colour tones which are in harmony with the aesthetic movement. 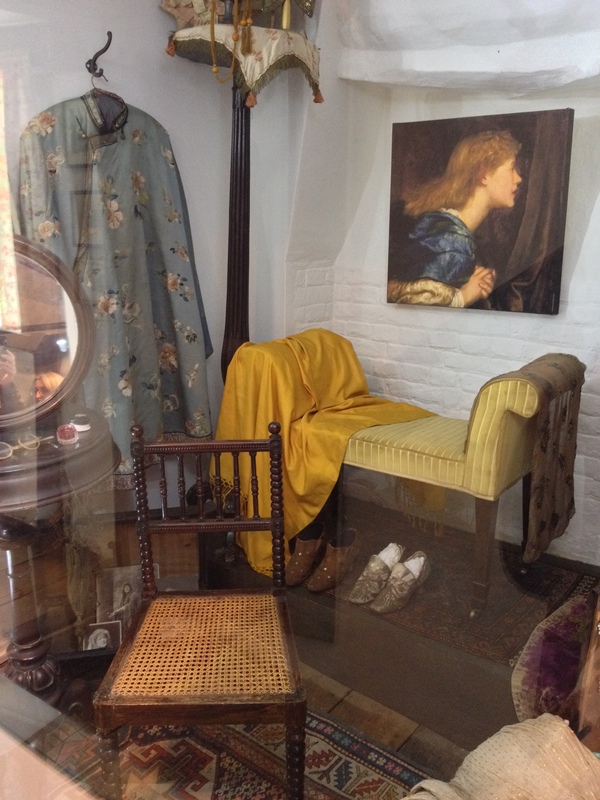 The dress is on display in Smallhythe Place. In 1877 Watts finally agreed to divorce Ellen and she married the actor, Charles Kelly. The marriage lasted two years. In 1878 Henry Irving made her his leading lady when he took over the lease of the Lyceum Theatre. With the Lyceum Theatre Company she toured the United States and Canada and remained working with Irving until 1902. The last part of the day was a tour of Smallhythe Place itself. The highlight of this for me was the opportunity to see the famous ‘Beetlewing dress’ which Ellen wore in 1888 as Lady Macbeth. This amazing dress is decorated with the iridescent wings of 1000 beetles. 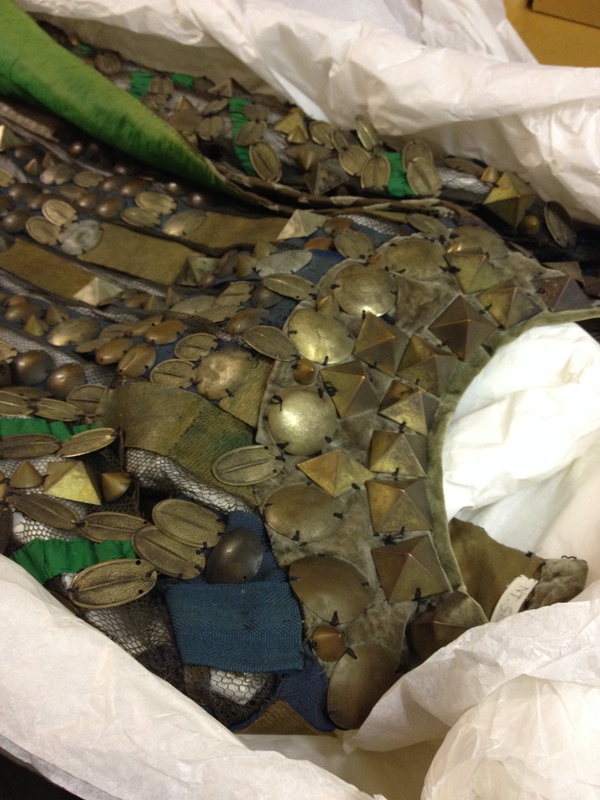 The dress recently underwent a major restoration at the hands of costume conservationist, Zenzie Tinker. Close inspection revealed that the existing dress was actually made of two separate dresses. It required over 700 hours of painstaking work to restore it to its original glory, reattaching hundreds of beetle wings, strengthening the fabric and piecing the two dresses together to restore it as closely as possible to its original form. 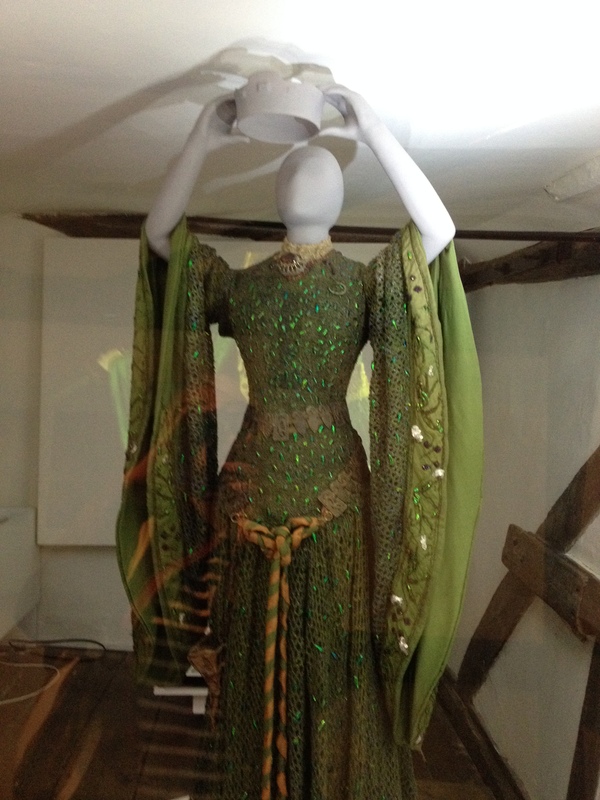 The famous Beetlewing Dress, which Terry wore as Lady Macbeth.